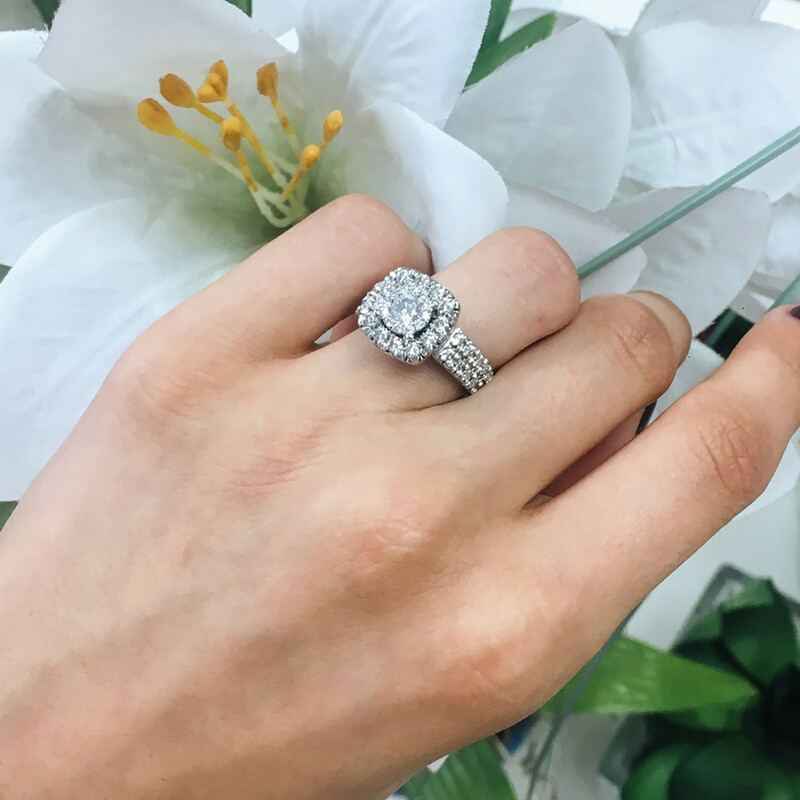 A 1 carat solitaire engagement ring featuring a conflict-free, natural, princess cut diamond center stone in H/I Color and I1/I2 Clarity. 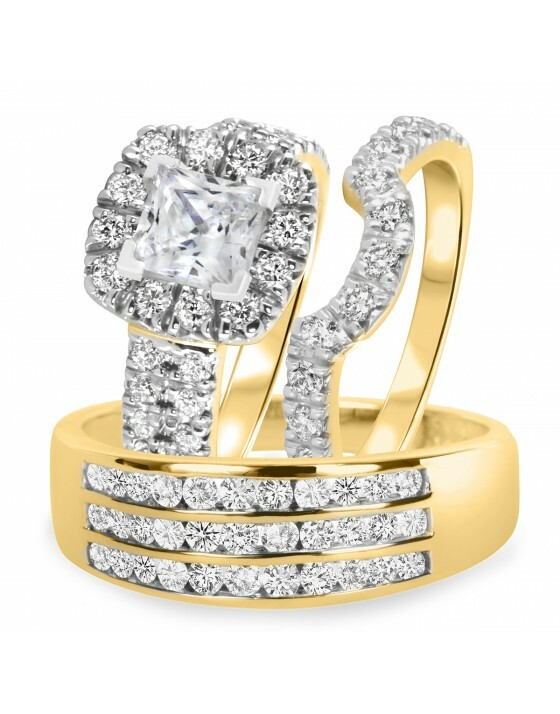 Two rows of diamonds or two rows of gold along the surface of the ring's band. 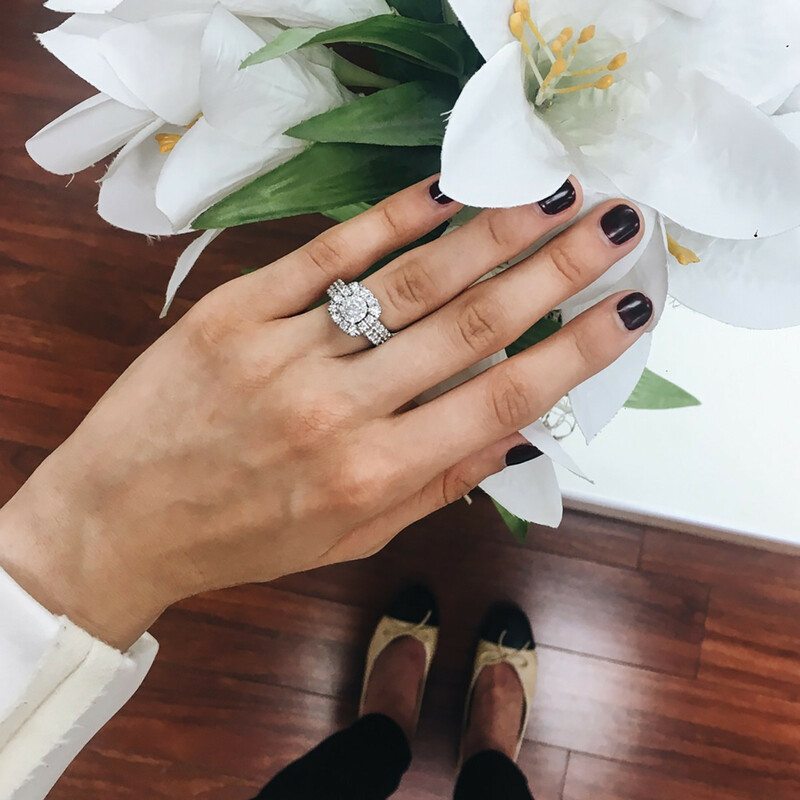 The Princess Solitaire of diamonds on this engagement ring can’t help but draw attention to your hand and show the world that you’re happily taken! 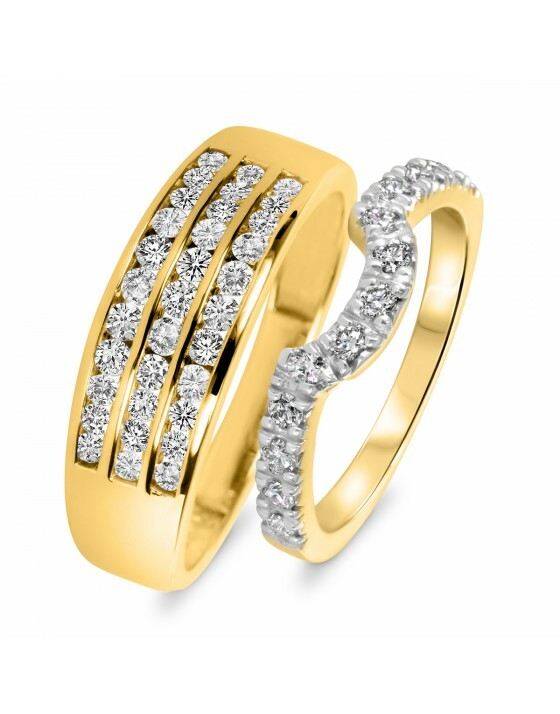 Prongs & side-stone settings fill the 14K Yellow gold with the brilliance of 33 stones, which sparkle with your love. 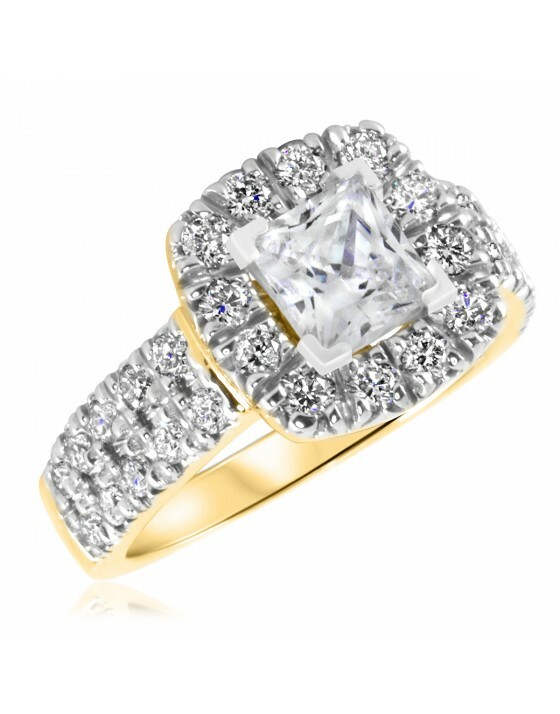 Round, Princess Diamond CutThe cut refers to the number of facets, or flat faces that a diamond has. 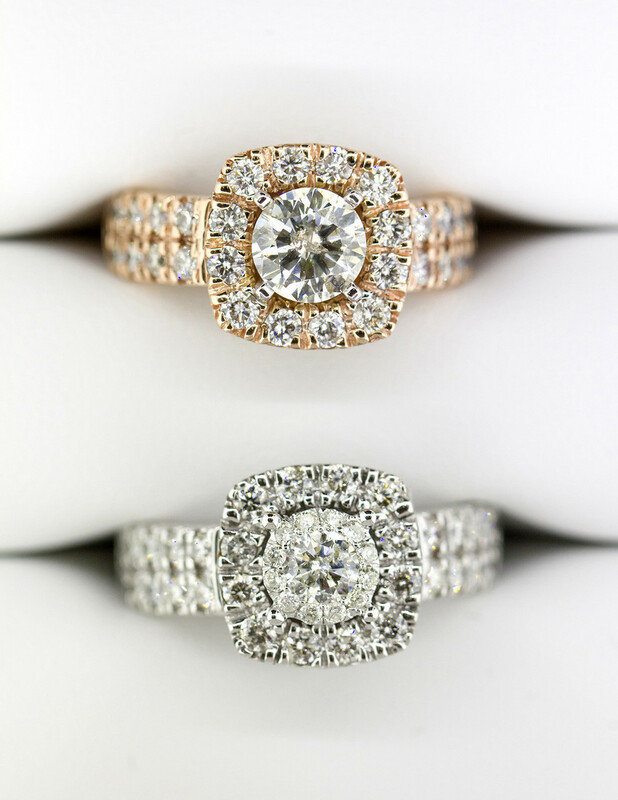 Cut is extremely important as it is what allows a diamond to unleash it's maximum brilliance and fire. 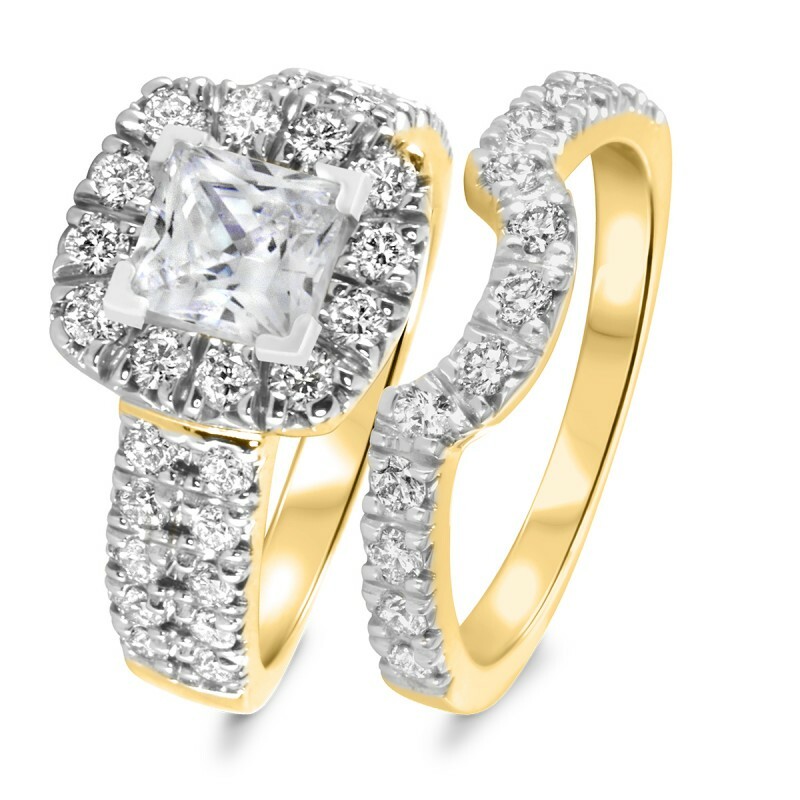 A well-cut diamond will reflect light and refract it back to your eye. 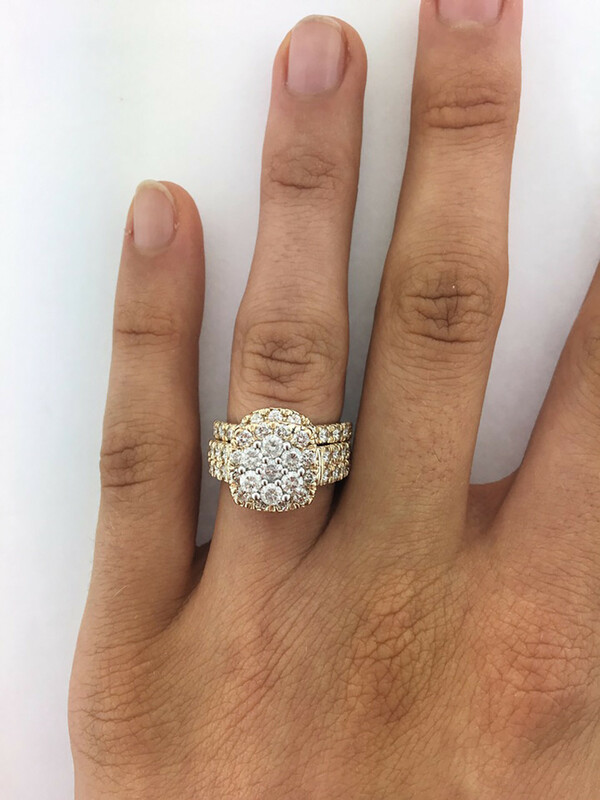 This wedding band curves to fit flush against the fancy cluster of the matching engagement ring in the set. 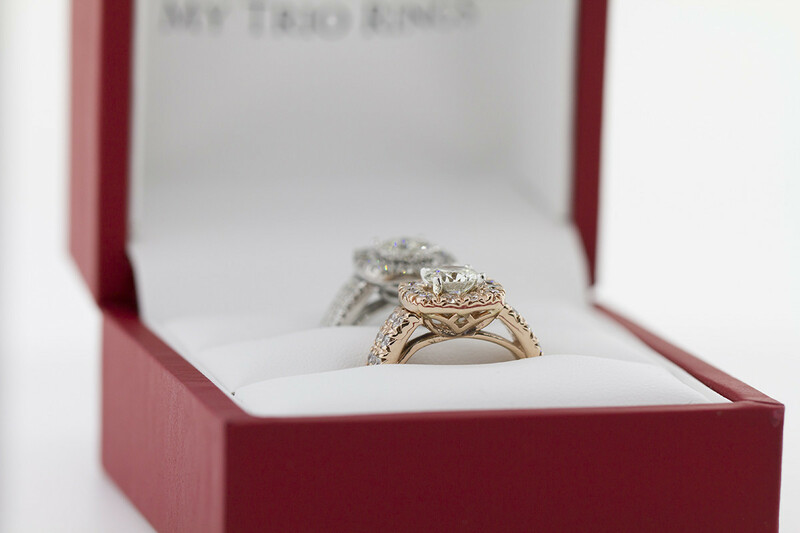 It complements without overshadowing, just like you will do as a spouse! 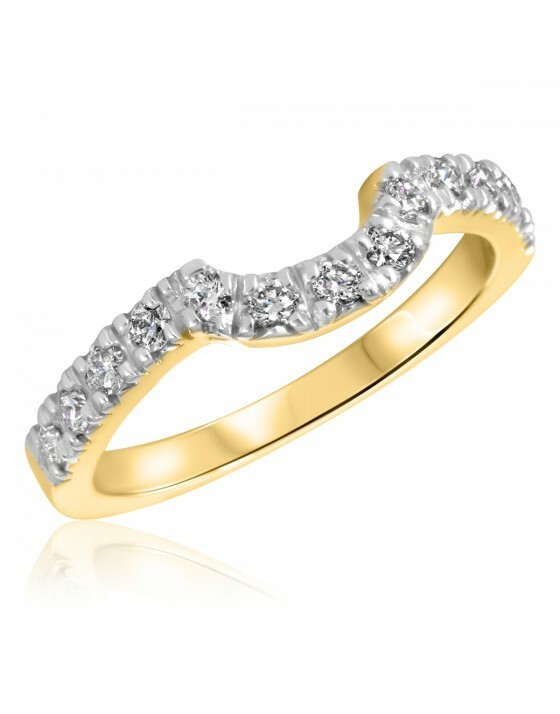 The elegance of diamonds set into luxurious 14K Yellow gold continues with this piece creates a flawless transition from one ring to the next. Worst engravings on the rings first of all. Can barely read it. Also order the mes band that they bundled with this, band separately is almost 1000. It looked like something out of a quarter machine. Then when I try to return it they make you pay 30 dollars without engraving refund. Do not order online. Thank you for sharing your feedback. 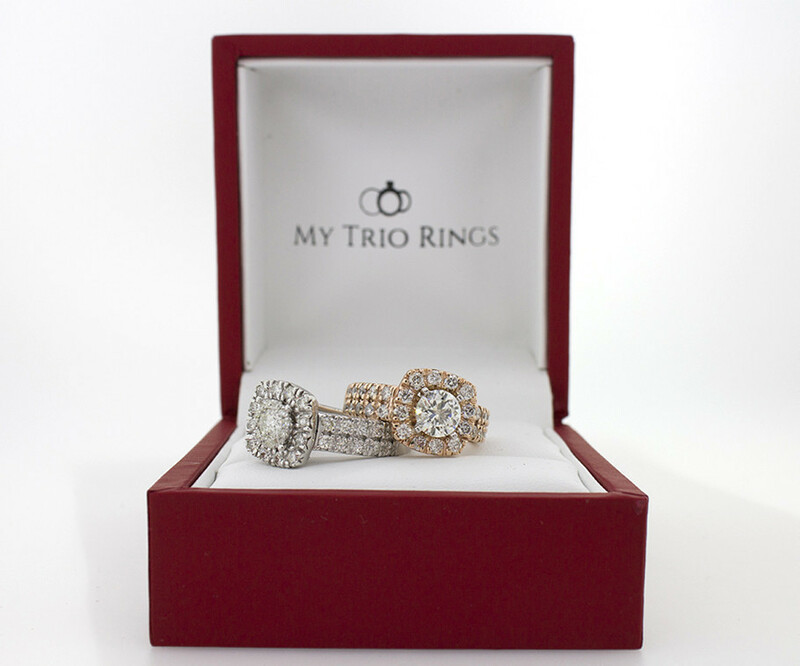 We're sorry to hear that the men's band was not to the quality you desired but we are delighted to have provided you a partial return so that you could keep the bridal set for the order. Your feedback is indeed heartfelt and we look forward to continuing to improve for our couples. 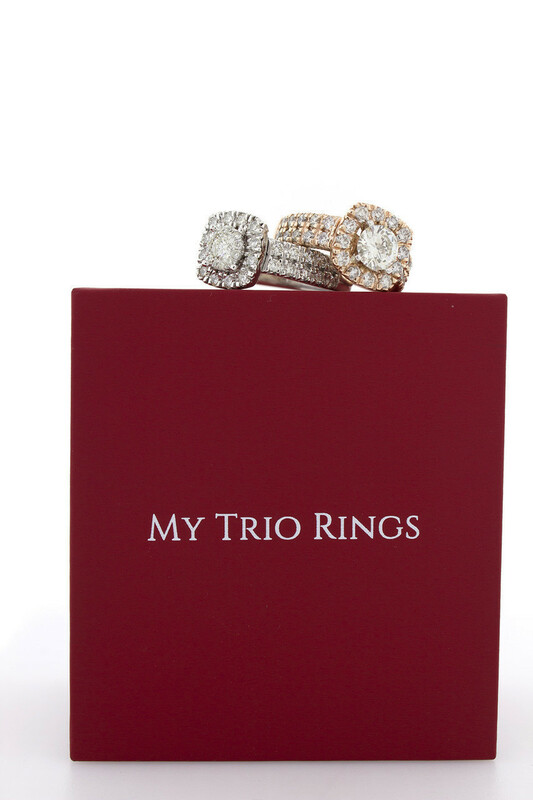 I have enjoyed the process of searching and receiving the perfect ring for my wife. It was successful.